Ever since I heard there was a Brown Derby restaurant in Albany, NY, it has sparked an undying debate in me. This debate is over the true origin of the Cobb Salad. As explored in this recent blog post, the actual origin of the Cobb salad has become somewhat of a mystery, and most people attribute it to owner of the original Brown Derby Restaurant in West Hollywood, Bob Cobb. I have been dying to dine at the Brown Derby restaurant in Albany, if, for nothing else, to probe the staff as to whether they (meaning the Brown Derby) take credit for the origin of this salad. Much to my chagrin, there is no Cobb Salad on the menu. But I had Cassie make us a reservation, and I wanted to eat there anyway. If you can imagine this, The Brown Derby is located in downtown Albany on the good side of Clinton Ave (across from The Palace Theater). The best option for parking on most nights is to use the valet (it was only $5 on the night we dined there). When you enter the restaurant, you are greeted by a very obviously European bald man. He is very hospitable and promptly seated us. There is an average amount of entrees on the menu, and the appetizer selection is relatively scant as well. 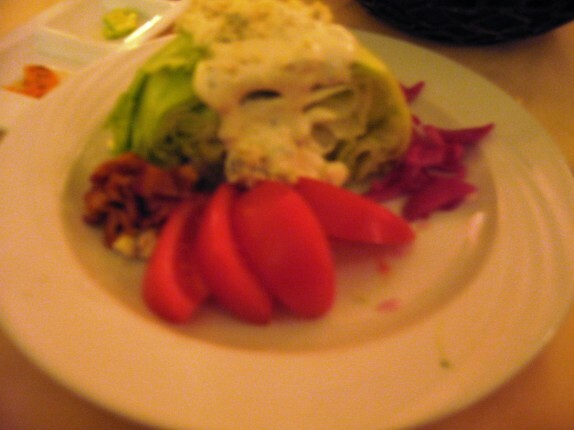 Under salads, they had a Derby Wedge salad, which had Iceburg lettuce, Local Tomatoes, Bermuda Onions, Crispy Bacon Lardons, and Maytag Blue Cheese dressing. This was the closest thing I saw to a Cobb Salad. So when the waitress approached the table and took our order, before ordering the Derby Wedge, I asked, “no Cobb Salad?” The waitress entertained the question and said they used to have it but took it off due to lack of popularity. That was the closest to confirmation that I’m going to get that the Cobb Salad originated at the Brown Derby in Hollywood. Anyway, I ordered the Derby Wedge. I thought it was great. The simplicity of a salad of just iceberg lettuce, tomato, bacon, onion, and blue cheese was perfect. I liked being able to distribute the ingredients per bite. That alone made this fun. Also, the blue cheese was not overpowering. I loved this dish. (You also can’t go wrong for $8 bucks). Dinner was a different story. I wanted to be simple, so I ordered Chicken Parmigiana. I figured that if it made it’s way onto the upscale restaurant’s menu, it would be something special, or at least just about what you get anywhere else. Things took a slight turn. I will revisit this point, but I cannot stand cauliflower. I will say no more here and save it for a later post. I immediately flicked it off the plate before it came into contact with the chicken. I couldn’t bring myself to try the pasta since the cauliflower was in contact with the pasta, but the chicken was fine. Ohh yeah, cauliflower and broccoli had nothing to do with the description on the menu. That’s all I’m saying about this place. Thumbs down. If I ever go back, I’m definitely ordering everything with no cauliflower. Oh, come ON, how were they supposed to know you hate cauliflower? My hubs hates it too (which I don’t get–haters, all of you), but he won’t let it get in the way of enjoying a great meal. What about the service? The quality of the food? The drinks? I had a TRULY terrible experience at the Brown Derby a few weeks ago, but they made it up to me immediately, and now I’m all BFFs with them again. Give them another shot–truly, they deserve it! 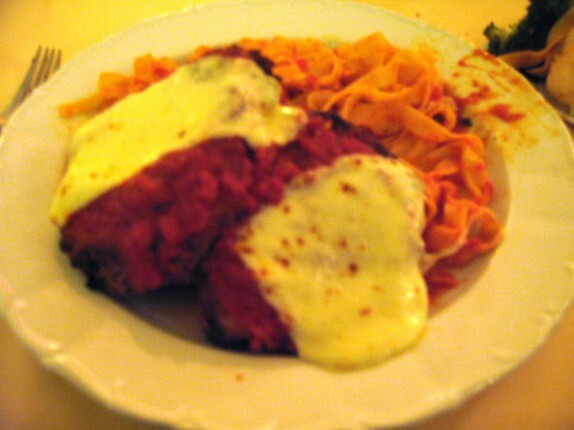 I have ordered chicken parm at countless establishments…never have I seen it paired with cauliflower. I’m not implying they should know I hate cauliflower, but if you want to include it on a plate, let me know it’s going to be there, and I won’t order that dish. Service was poor, overall quality of the food was ehh, but I’m really getting tired of chefs getting cute and including things that aren’t part of the dish they describe on their own menu! True, it is a weird pairing, and I get your point. I also better understand your thumbs-down review now that I know you had bad service. For me, bad service makes all the difference. Still, you should at least TRY to like cauliflower. It’s totally good for you and very tasty! When I read rgua, I told him he went way to easy on them. The service was horrendous…not just terrible. The best service we received all night was from the valet. It honestly wasn’t worth it to say anything the night we were there because we just wanted to leave. I made the reservation through Open Table & they let you send comments to the restaurant. I wrote a thoughtful comment including the good and the bad. I included my name, phone number & email address but, I haven’t heard anything. I’ve been there plenty of times before but, not since Larry Schepici became the new head chef. Honestly, the food used to be better. My dish (seafood risotto) was part undercooked, part overcooked and under seasoned (or not seasoned at all). My appetizer was ok but, nothing special and presented poorly (it looked totally unappealing). I don’t know if I’ll go back. If I do, it won’t be any time soon. There are plenty of other places in downtown Albany that serve quality food in that price range or less. Also, I pretty much gave the salad (which really doesn’t get any simpler) a rave review. Because they said what i was going to get, and that’s all that was on the plate they presented to me. Menu descriptions should openly disclose anything out of the ordinary that will be served with the dish. Broccoli and cauliflower with chicken parm? That’s just wrong. We went to the BD last week; that’ll be the only time for us. No high chairs – well, OK, but if you’re going to promote your kids’ menu one would have thought you might, no? Fifteen minutes between being seated and coming to ask for a drinks order? And then another ten before taking a food order? And then twenty more before bringing the appetisers? OK, unless the food is fabulous we’re done here..
..and it wasn’t: mediocre at best, and the ‘boeuf bourgignon’ was in fact sliced strip steak with a red wine reduction sauce poured over. That’s not even close. We cancelled dessert and hit the road. So long. 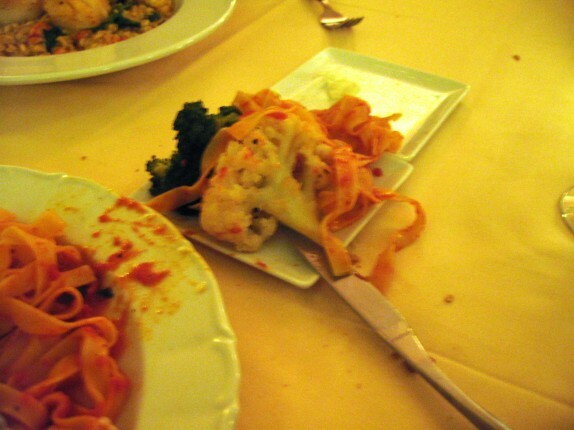 Which is really too bad; Tosca – the BD chef’s prior home – was our all-time local favourite before the tax man got it. Our service started poorly. The waitress immediately asked what we wanted to drink before we could see a drink menu. That’s usually the kiss of death for me ordering drinks somewhere new. I had tap water the whole time. It was about 15-20 minutes til we ordered appetizers (we ordered dinner at the same time, since we were sure by then), another 15 before they came out, and another 30 or so minutes before the dinners came out. Our waitress disappeared and a bunch of awkward dudes kept coming over to the table, including a manager-type guy who ran our dinners over. This guy apparently “looked like he didn’t know how to walk” [quote from Cassie]. It was a poor experience overall, but my mind keeps going back to the cauliflower because I cannot stand it. Last Saturday Kate & I ate at “The Hollywood Brown Derby” in Hollywood Studios in Disney World. It is an exact replica of the one in Hollywood, owned by the same owner, and has the exact same menu. I actually got the Cobb Salad – no blue cheese since my hatred of it is the same as yours with cauliflower. I won’t eat anything that touches blue cheese. I have to say, my Cobb Salad without blue cheese there was amazing. It had tomato, avocado, egg, bacon, turkey, etc. The “Cobb Dressing” was similar to regular Italian dressing. So if you want one and you’re ever in Disney – that’s the place to get it. It was so big I didn’t finish it because it was only the appetizer. For dinner I got one of the most incredible cuts of filet minon I ever ate. Dessert was a banana foster type dessert that gave my mouth foodgasms. One of the best meals I had while on the honeymoon. But the service STHUKED! I’ve thought about going there and taking Frank, but after this review I will not be. How hard is it to get Chicken Parm right? And although I don’t understand your aversion to cauliflower, I will agree that not only was it weird to be paired with that dish, it should have been stated. Even “served with chef’s choice side vegetable” would work there. I agree that my aversion to cauliflower is 100% irrational. When I finish this anti-cauliflower post, this will become even more obvious to the public.